Today the sun appeared for the first time of this trip, treating us to some epic early morning views of the Alps. Once again we were off early in the direction Les Carroz in search of more fresh powder. Sadly though all that lovely powder had been compacted down overnight. I enjoyed lots of wide controlled skidded tail slides trying to see just how far I could push the envelope and beginning to feel levels of confidence on the pegs that I had previously only felt with footskis. Meanwhile Carl was heading off piste at every opportunity to find all available stashes of untrammelled snow. We headed back towards Flaine and at the Tete de Saix, Carl looked at the massive expansive of hill below us and said "I can do that", "ok" I replied "let's do it". What followed was, by my standards, a massive off piste descent performed on the pegs. I found out later that our progress had been closely followed by the mountain bike loving lift operator of the Le Lac chairlift with a telescope. Hoping not to be an example of that old riddle "What happens when an unstoppable force meets an unmovable object?" I opted for monster long traverses, mainly to avoid having to turning anywhere vaguely near the fall line. The gradient was a lot more intimidating than it appears from the cosseted comfort of the Corbalanche chairlift. It was easier to wait till my trajectory intersected the sortilege piste and turn there. Another time I got off the skibike and turn it through 180 degrees, cheating! I fell a couple of times and figured out quickly that you have to tramp down the snow to build a mini staircase above your skibike. In the late afternoon, I headed up to Les Grande Platieres and played on the mephisto runs by skibike, having previously only attempted these runs on SnowBlades. They gave me the ideal opportunity to work on my skibike carving technique. I think I might be finally starting to understand how to carve a skibike. You need to tilt the skibike, this feels like pushing the handlebars down in the direction you want to turn. Your legs and hips incline with the skibike but the top half of your body remains vertical. This is analogous to articulation used in dynamic skiing turns. Much as I love getting the tail of the skibike to whip out at every opportunity, the carving sensation is a whole new level. The sensation of grip is unique and very reassuring, being locked into an invisible track in the snow like a Scalextric car, that even bumps don't seem to unsettle. The downside is that you create so little drag that speeds steadily climb till you have to skid to remove speed....or crash out. 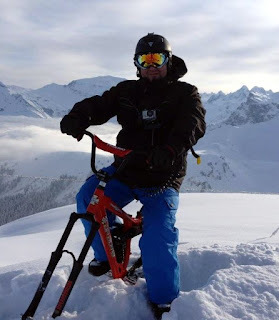 We are now 4 days into this trip and I have exceeded my personal goals, to be able to freestyle skibike "on the pegs" in control and with a level of confidence that I only previously knew with footskis. Meanwhile Carl is already standing on the pegs, on and off piste and producing the sort of POV video material that inspired him to follow his chosen skibike path.